The Cyton-CXP4 can be configured in many different ways. It can acquire from one quad CXP-6 camera (total data rate: 25 Gb/S) , or four single link CXP-6 cameras, or anything in between. When acquiring from multiple cameras, each camera is attached to its own virtual frame grabber. This allows independent acquisition and control of each camera. However, when a four link camera is attached, only one virtual frame grabber is needed. 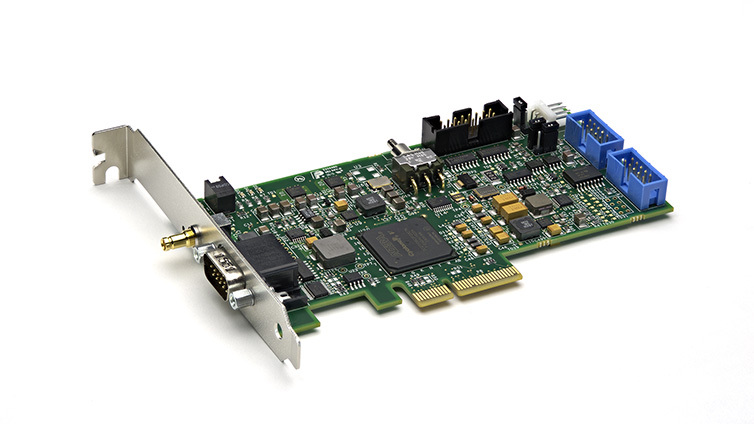 The Aon-CXP is low cost single link CoaXPress frame grabber. While it looks tiny, it has all the power of its big brother, the Cyton. It supports CXP camera speeds up to 6.25 Gb/S. The technology that Machine Vision components are built on are advancing rapidly in performance, while size and costs are plummeting. CoaXPress cameras, which traditionally were power hungry, large and expensive, are now small, cool and affordable. Single link cameras are coming out that are 29mm cubes. While this sounds tiny, they can still get 6.25 Gb/S worth of data over the link, almost twice the real world data rate of the USB3 Vision standard and significantly quicker than the latest GigE Vision data rates. The means you can get 2 MP images at 300 FPS!